Looking for something different? Try parsnips! They look like white carrots and are usually found in the grocery store not far from their carrot cousins. If you haven’t tried them, parsnips are naturally sweet with a hint of honey flavor. Some describe the flavor as almost nutty. However you describe it, they’re worth a try. Here’s a simple recipe for oven roasted parsnip fries. The recipe is below the video link. I hope this helps! Wash and peel the parsnips. Cut a small slice off both ends of each parsnip and discard. Cut them in half crosswise. Cut each half into lengthwise strips, like French fries. Place them in a single layer on a parchment paper lined baking sheet. Drizzle them with oil and sprinkle with salt to taste. Toss them to coat all pieces with the oil and salt. Be sure they are in a single layer and no pieces are on top of others. Roast in preheated oven for about 20 minutes. Remove the pan and toss the fries to turn them over. Be sure they are in a single layer, then return them to the oven. Roast for another 10 minutes (total roasting time about 30 minutes), or until they are as brown as you like. Remove from oven and enjoy! 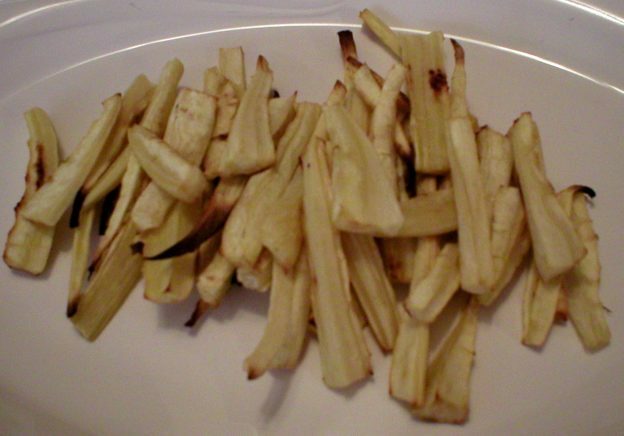 This entry was posted in Food and tagged easy roasted parsnip fries, how to roast parsnips, roasted parsnip on April 2, 2019 by Judi.